during a trip to Washington, D.C.
(Washington, D.C.—Feb. 11, 2019) In an effort to shine a brighter light on the persecution of religious minorities in China, ChinaAid delegation members met with U.S. Representative Chris Smith and held a panel at the Family Research Council on Wednesday. Smith, who is a long-time advocate for human rights and religious freedom in China and once chaired the Congressional-Executive Commission on China, and a member of his staff met with the ChinaAid delegation and heard from Kuzzat Altay, an Uyghur man whose father was imprisoned in one of Xinjiang’s concentration camps last year, and Li Chingyu, the wife of Taiwanese human rights activist Li Mingche, who was abducted to China from Macau and jailed. When Li Chingyu held a press conference to highlight her husband’s plight, China revoked her visiting rights for three months. So far, Li Mingche has lost about 66 pounds during his incarceration. 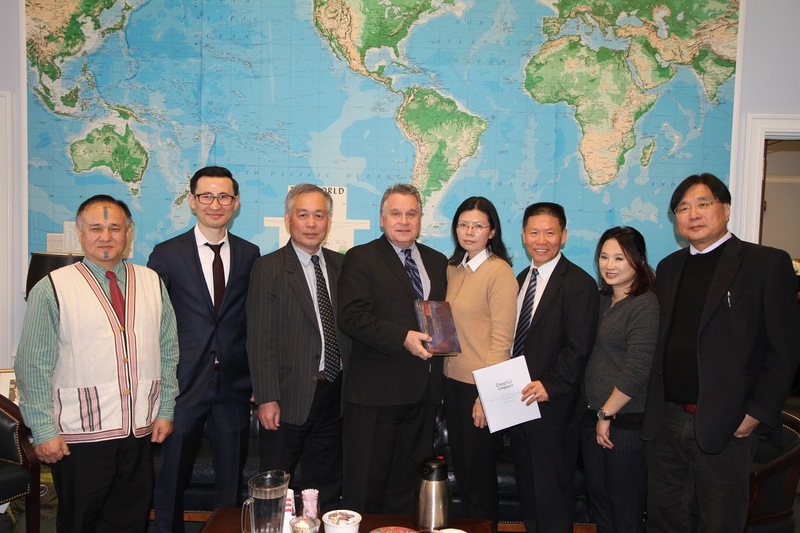 After the meeting, the delegation headed to the Family Research Council, where they hosted a panel focused on religious freedom and human rights abuses in China. Both Altay and Li Chingyu shared their stories.